Security has always been part of humans’ basic needs. Since the start of business and open market trading, security issues cropped up around protecting housing, stock, land, and shops or factories with gates, fences, locks and watchmen. In our changing society, our social and economic structures interconnect with our legal system, governing what we can and cannot do and protecting us against injustice. Underpinning this is how we perceive crime and the morality of our society. There is an obligation on business owners to trade ethically and honestly and to be treated ethically and honestly by everyone they come into contact with – in other words, in an atmosphere that deems that crime is unacceptable. As a security practitioner for over 40 years, it is not for me to pass judgement on our society but merely to look at where we are and apply the necessary protections to businesses that are security and safety aware. It is a well-known fact that the main security threat – from minor to major loss – comes from within an organisation. Over the years, then, security design has responded to the increased issues of internal theft and threats from outside the client’s business. 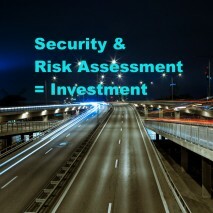 It is important to understand that, today, security design takes into consideration all aspects of risk to a business. This is a major move away from the old-style reactive systems to prevention of loss by having the foresight to apply the necessary solutions to protect business people, property and assets against potential loss. These are common areas of concern where, as a rule, general conventional principles of prevention can apply. No company should underestimate the security risk to their business and that degree of risk is associated with a number of important variables. An assessment by management with the expertise of an experienced security professional will identify threats and tailor specific preventive solutions to an individual business. In most cases, security is seen as a necessary expense to prevent criminal behaviour and protect company property, and therefore it subtracts from the bottom line. Security, for some businesses, can be a reluctant investment with no thought going into loss prevention other than a knee-jerk reaction and investment of the least amount possible. With the right approach, knowledge, skills, and an understanding of the scope of prevention, security can and does contribute to the profitability of a business. At an individual level, business owners have a responsibility to educate their staff on the importance of protecting their assets: their people, products, hardware, software, physical infrastructure. The main goal is to create an environment where honesty is paramount and everyone benefits through security of employment. To conclude, a security programme is based on a clear understanding of all the conditions that subscribe to losses within a business. Failure to recognise and understand these conditions will lead to security weakness and inevitable losses – and that is the ultimate threat to a company’s profitability.